Whether you have an existing eCommerce store or are looking to expand into this area, you’re probably wondering what the best eCommerce platform actually is. 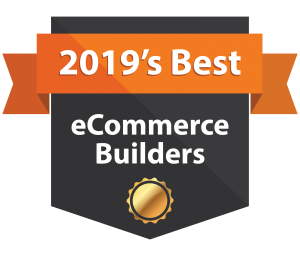 There’s absolutely no shame in opting for a website builder in 2019. I mean, who has the time to learn how to code, or even the money to hire a web developer?! Well, that’s the reason eCommerce platforms exist in the first place, to make life easier! I’ve gone and tested all major e-commerce builders. Launched in 2006, Wix now has a customer base of over 100 million users. What I’ve always loved about Wix is it’s simplicity. If you’re someone who has never even considered building a website or online store before, Wix won’t scare you off. And, if you’re not 100% confident in what you’re doing, you can assign roles to other people that you know. This allows them to take the burden off of you and manage your site with as many permissions as you want to give them. I think Wix is probably the most reasonably priced eCommerce platform I’ve seen. You may not receive quite the same features as some of the bigger players, but it’s certainly enough to get a website, blog, and online store up and running within a few hours. + Themes & Templates: When it comes to templates, Wix absolutely exceeds in this area. Every single one of their templates looks professional and they’re incredibly easy to work with. They have well over 500 templates to choose from, and they are all FREE! Every single one of Wix’s templates allows you to view your eCommerce website on a mobile device. This is super useful to ensure that your customer base can access your shop on the go. As of April 2018, over 4 billion active internet users were present. That’s an enormous amount of people to reach out to! From business templates to travel & tourism, you won’t find a better selection than Wix! And, if you’re not quite ready to go live with your site, you can implement one of Wix’s landing pages (yup, they’re free too)! + Drag & drop: Wix’s drag & drop technology is truly innovative. Whether you want a video background, parallax site, or a simple store, you won’t find an easier platform than Wix. You can keep up to date with their latest features on a month by month basis too! + Fast setup: From start to finish, you can sign up and get started on your first site with Wix within 5 minutes. + Blog implementation: If you’ve created your online store and want to add a blog to it, you don’t need any coding experience to do so. Simply click the blog button and you can choose a blog template to integrate with you’re new or existing store. + 24/7 support: If you need help, Wix are on hand 24/7. I’ve tried and tested their customer support – they’re friendly, helpful, and quick to respond! – Adverts: You can build as many websites as you like on Wix’s free plan. The downside is that you’ll experience adverts and branding across your web page and within your URL. If you want a professional look, you’ll need to fork out some money. – Template switching: Once you’ve decided on a template, you can’t change your mind. Well, you can, but you won’t be able to keep your content, you’ll have to start from scratch. SITE123 is one of the longest standing eCommerce platforms currently on the market. They offer plenty of tools and features aimed at personal and business websites. It comes with a website design editor as standard, so if you want an easily made, professional website, SITE123 can offer this. SITE123 claims it is the easiest website builder around, and I find this hard to disagree with. It’s intuitive design means that you can create a website in minutes with little to no effort. Of course, that doesn’t mean you can’t unleash your stylish side if you want to. SITE123 offers it’s users the ability to get a site up and running very quickly with it’s pre-made website structures. At the same time, if you want to experiment a little more, you can edit existing templates to make them your own. Content is king, and this is what SITE123 really focuses on. + Themes & Templates: There’s lots of templates available to choose from when you sign up to SITE123. It’s really easy to find something suitable, with loads of categories to get you started. Each template is intuitively designed to cater to your needs. The beauty of SITE123 is that each content block is laid out for you. If you select a category, your website’s pages will be pre-made so you don’t even have to organise anything! You can simply focus on creating and adding your site’s content. 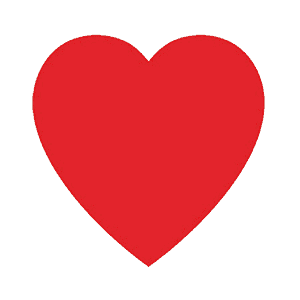 Alternatively, if you don’t like how your template is designed, you can shuffle it around and edit it to your heart’s content. Once you’ve selected your chosen category, SITE123 goes into even further detail. For example, if you choose an online store, you can then specify what type of online store you want to create. Depending on what you choose, your template will be created in the background ready for you to get started. Literally 3 steps, and you could have your website live within a matter of minutes. + Online Store: Not all website builders offer an eCommerce option. Luckily, SITE123 does, and it’s just as easy to create as a personal website or blog. Simply upload the products you want to sell and customise them all (or individually) via the easy to use settings. + Customer Support: SITE123’s excellent customer support is available 24/7. They have a live chat feature too, so if you have questions before or after sign up, it’s easy to get help from their friendly staff. + Mobile Responsive: All of SITE123’s templates have been carefully designed to be mobile responsive. Whether you’re using a desktop, smart phone, or tablet, your website or online store will look great on all devices. Most importantly, it will work, and you only have to create your website once! – Subdomain: SITE123 offers five kinds of plans; free, basic, advanced, professional, and gold. If you choose the free option, you’ll unfortunately be limited to using a SITE123 subdomain. You can’t connect your own domain, so I’d recommend paying for one of the four premium plans if you want your website to look professional. – Branding: Unless you’re willing to upgrade to the premium plans, your website will be branded with the SITE123 logo. Shopify is undoubtedly a company that you’ve already heard of. Over 1.5 million websites use Shopify, with a steadily increasing market share over the years. 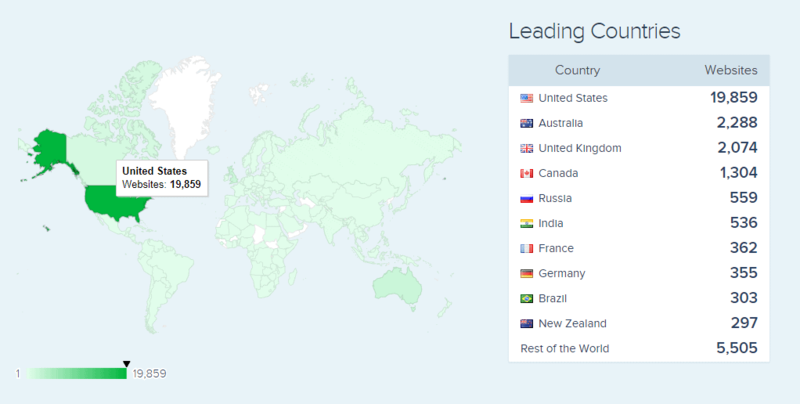 Shopify is most popular in the United States, followed closely by the U.K., Australia, and Canada. If you’re not keen on learning the ins and outs of how eCommerce builders work, then I highly recommend Shopify. For beginners, and advanced users alike, Shopify is super easy to get to grips with and continue using. Not only can you create an online store, you can create a website and blog using Shopify’s wide selection of themes and templates. What’s more, you won’t be limited to how many products you want to sell or how much data you want to save regarding your customers. The real difference between Shopify’s price plans is reporting and analytics, but I’ll go into this in more depth later on. Some pretty big names there aren’t there? 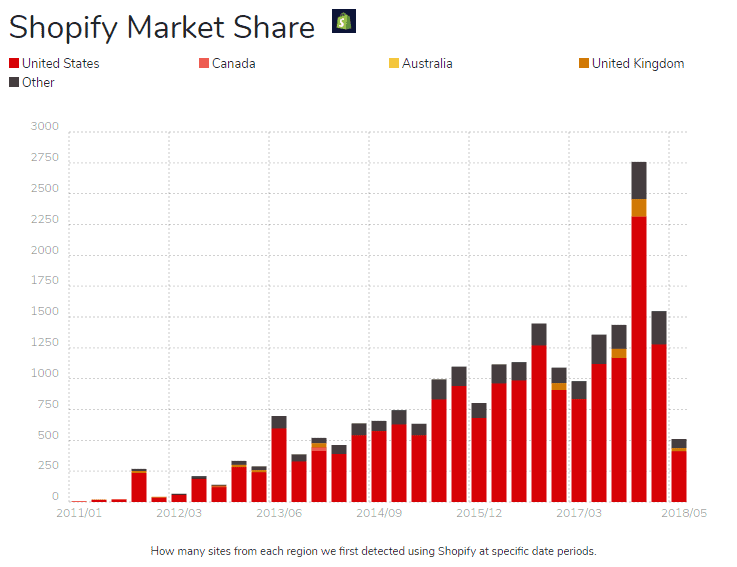 That’s because, in my humble opinion, Shopify is awesome! I know it’s all well and good saying that, but why do I think they’re so great? I’ve put together a list of pros and cons based on my personal experience so that you can make your own decision. None of these images or scenarios are fabricated, they are a true reflection of the Shopify testing I completed. + Customer Support: Shopify’s customer support is accessible before you’ve even signed up. You can gain instant access to their Help Center whether you’ve decided to become a customer or not. Their actual support is available 24/7, with a wide range of solutions and contact methods available. I thought I’d try my luck contacting Shopify’s live chat to establish how long it would take to speak to someone, and whether they were particularly knowledgeable. I submitted my question via the support page and within 3 seconds I was connected with a lovely agent called Katie. Not only was she really friendly, Katie knew her stuff too which was very reassuring! I felt at this point that Shopify would genuinely be available for me 24/7. And if you don’t have the time to chat to someone, you can tweet them, send an email, or call them – so many options! All in all I was really pleased with the service I had received. + Instant support: I was connected to an agent within 3 seconds in my test. Their support is world class; not only are they friendly, but they’re actually helpful too! + Loads of themes: Shopify has so many themes to choose from, I was a little overwhelmed. They have a great selection of paid and free themes, giving me the confidence that I would never struggle to find a theme that was suitable. + Unlimited products: There are no limits on any of Shopify’s pricing plans regarding products. That means you can sell as many products as you like on your online store – brilliant! + Website and blog: Shopify offer the whole package, it doesn’t just stop once you’ve created an online store. You can create and integrate your website and/or blog to your online store keeping your styling consistently beautiful throughout. + Free SSL certificates: If you’re selling products online, your customers are going to want reassurance that their details are secure. Free SSL certificates means you don’t have to fork out for extra security, as it’s already there. – Transaction fees: Unless you use their Shopify Payments to take money on your website, you’ll have to pay a transaction fee on each sale. These range in cost across each pricing plan from 0.5% to 2%. – Monthly subscription increase: Although there is a set monthly subscription price per plan, this could end up increasing if you’re not careful. There are loads of Shopify Apps that are free, but not all of them are. Don’t be caught out and end up spending more than you originally wanted. BigCommerce is extremely popular in the U.S. where most of it’s usage comes from. According to data obtained by SimilarTech, BigCommerce powers over 36,000 websites with a high popularity in the shopping market. 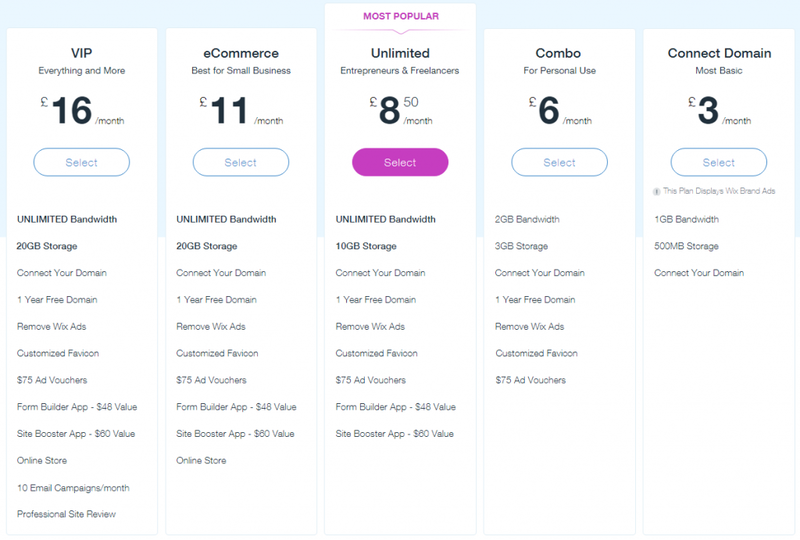 In terms of pricing, BigCommerce fit in pretty nicely with the rest of the market when it comes to their standard plan. What’s more, you can try their platform for free for 15 days – result! As with other eCommerce website builders, you’ll have access to unlimited products, storage, and bandwidth too. There’s no wonder such big names are using BigCommerce – they don’t charge transaction fees! That’s right, 0% on every plan, including their standard one at $29.95 per month. I was pretty much hooked from this moment on, eager to find out more about the company. + CRO Tools: If you’re thinking about selling anything online, you’re going to want to consider conversion rate optimisation (CRO). That’s if you want to sell your products (of course you do)! A lot of companies offer basic CRO tools and features, but BigCommerce seem to excel in this area. According to a recent study by Barilliance, 77.24% of shoppers abandoned their cart in 2016. 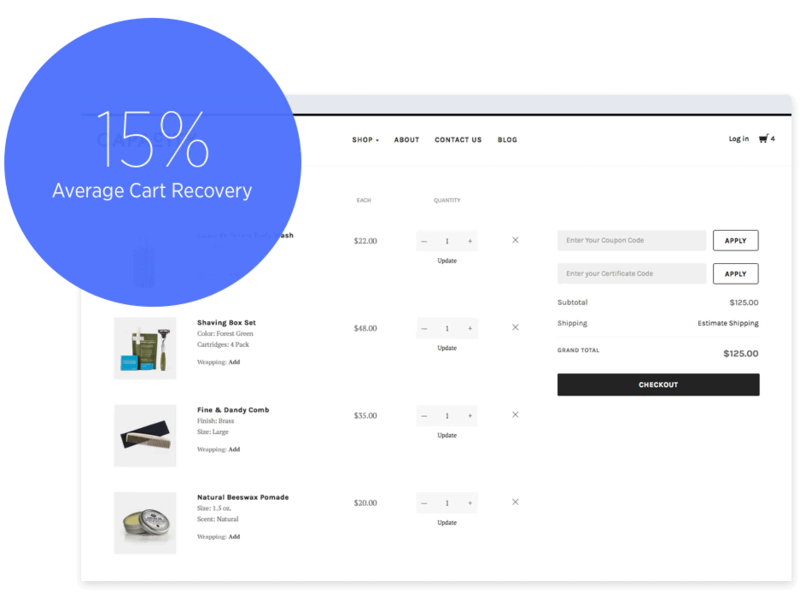 BigCommerce’s Cart Abandonment Software boasts an average 15% cart recovery. Their tools allow you to customise cart abandonment emails, focusing on timing, content, and offers. Once you’ve put in the hard work, you can track your cart recovery, monitoring analytics about every part of your business. There are SO many tools that BigCommerce offer that would be useful to any business. I strongly recommend BigCommerce to those who are serious about their online business, especially if you don’t mind putting in the effort to achieve big results. + Easy sign up process: Having never used their website before, it took me an average of 90 seconds to sign up to BigCommerce. I was accessing my dashboard almost instantly without any form of helping hand. + Extended list of features: The features that BigCommerce offer are astounding. From CRO tools to traffic analytics, order reports to marketing campaigns. For what you pay per month, you get a serious amount for your money. + Easily customisable: If you’ve never used an eCommerce platform or website builder before, you won’t feel uneasy using BigCommerce. Every aspect of their customer journey is simple, including the customisation of websites and online stores. + Free SSL and HTTPs: Every plan includes free sitewide HTTPs and a dedicated SSL certificate. Although this does tend to come as standard with most eCommerce builders, it’s a definite nice to have. + Responsive design: BigCommerce ensures that all of their themes are responsive. Whether your customers are on a mobile, tablet, or a computer, your online store will be accessible and will look great – guaranteed! – Annual sale limits: Although you can sell as many products as you like on each plan, you are limited to how much you can earn. If it looks like you’re going to exceed your annual online sales, you’ll need to upgrade your pricing plan. 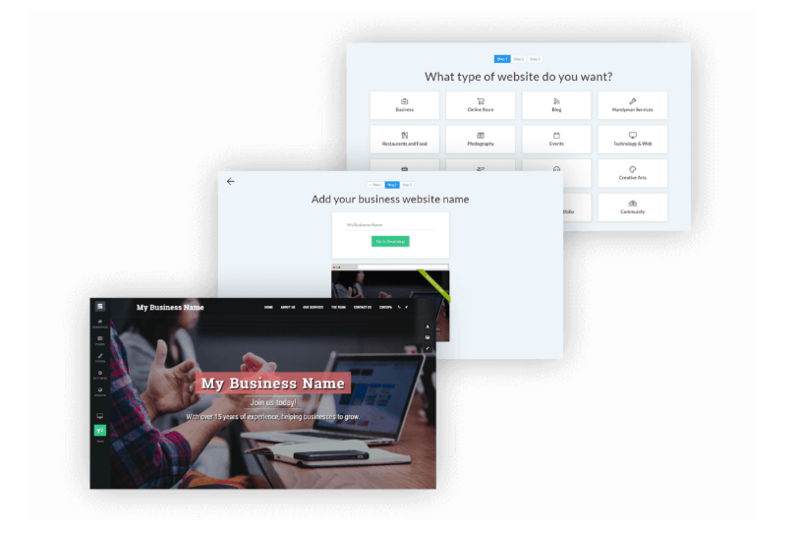 – Premium template prices: Understandably a lot of time and effort goes into themes and templates. However, the cheapest paid template on BigCommerce’s store starts at $145 which I feel is a little too steep. With over 800 members of staff, SquareSpace has grown into it’s own since it’s release in 2003. SquareSpace has become hugely popular over time and even boasts it’s own YouTube channel which regularly receives views in the millions! What I love about SquareSpace is they keep things simple. 2 prices, both in GBP (yay!) with a list of features they offer. On both of SquareSpace’s plans you’ll be able to sell unlimited products with no transaction fees – love it! For me I think SquareSpace is my favourite eCommerce website builder for templates. Some of the work that is produced is truly inspirational and I could definitely see myself creating a professional website from their selection. I mean if John and Keanu are using SquareSpace, so should you! What a stunning list of websites created with this modern and slick website builder. I can tell you’re impressed! + Style Editor: Similar to the way Wix and Weebly allow you to customise templates without any coding knowledge, SquareSpace have their own style editor. The thing is, it’s really powerful, so much so that you can change pretty much anything you want to design your perfect website. For me, consistency is key between a website and an online store. Often I’ll come across a great looking website that links to an online store that bears no resemblance to each other. SquareSpace’s clever style editor ensures you can link pages together that you want to keep consistent. For example, if you change the header colour on your product page, you may want that to continue through to your shipping page. It’s so easy to do! If you happen to know a bit of code, or someone else does, you can implement custom CSS into any of SquareSpace’s templates! The possibilities are truly endless. + Stunning templates: You’d think all of SquareSpace’s templates were professionally crafted. + Mobile-ready: When you’re viewing a SquareSpace site, it automatically detects the device you’re using in order to adjust to the correct size. 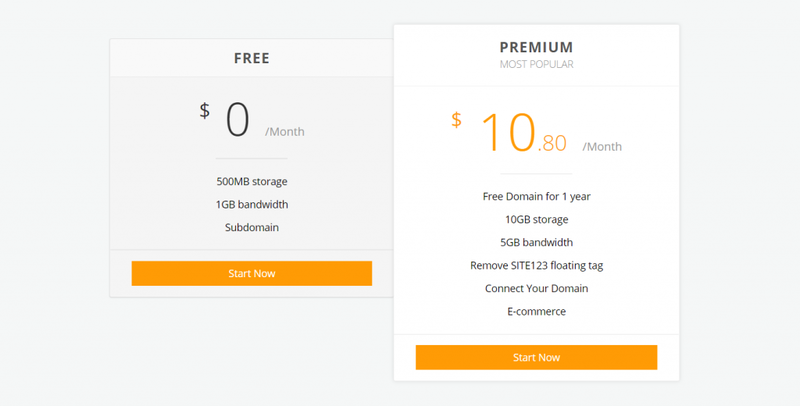 + Simple pricing: As we’ve already seen, pricing is simple with SquareSpace. It is what it is, outlining features for each plan side by side. – No mobile editor: Although SquareSpace’s templates are mobile responsive, there’s no way to manually edit the mobile version of your site. It’s not the worst thing in the world, but if you wanted to create a separate site for mobile you’re not able to. – No telephone support: You can contact SquareSpace via email or live chat, but there’s no phone support. If you’re on a budget or not quite sure whether an online store is right for you, I’d recommend Weebly. With their starter plan from only £5 per month, you can’t go far wrong! However, if you want to balance the tables by selling lots of products and not spending much, you’ll need opt for Weebly’s business plan. Founded by a couple of college friends, Weebly now powers over 40 million users on a monthly basis. And just because they’re a cheaper option, it doesn’t mean they don’t have features to show off. Weebly’s marketing tools are a brilliant introduction into the world of social media and SEO. You can create abandoned cart emails, generate adverts, and monitor your site’s statistics. If you take a look at the websites above, you’ll see that they look really professional and simply quite stunning. Affordable doesn’t necessarily mean you’re opting for a downgrade. You might not be able to do as much as other website builders, but Weebly definitely packs a punch where it matters. + Shipping management: It might sound a bit boring, but shipping and inventory management is essential if you’re selling products online. This tool really shows me how good Weebly is – they haven’t scrimped on their features just because they’re cheaper than other website builders. Weebly’s shipping tool allows you to enable real-time shipping rates. If your business has a DHL, UPS, or FedEx account, you can link your Weebly store directly to it. You can download shipping labels and manage all of your orders in one easy to manage place. + 40+ pre-designed pages: If you are struggling with inspiration, Weebly has loads of pre-designed pages for you to work from. + Responsive themes: Weebly has a great selection of trendy themes that are mobile responsive. + Quick site build: Because Weebly doesn’t have every fancy feature available under the sun, creating an online store and website is really quick and easy. – Blog features: Weebly’s blog features are sadly quite limited. You can’t show your latest and most popular posts. – Limited customisation: Although their drag & drop builder is really easy to use, it does lack some features. For example, you can’t change column width, which is pretty standard with other website builders.